Choose from 180+ industry standard construction contracts and forms! 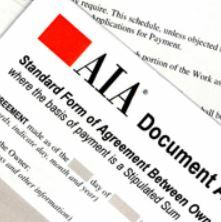 Start by going to the AIA Contract Document website to search for the documents you need. Got Contract Questions? Call our experts at AIA National Document Support 202-626-7526 (Mon - Fri 8:30am-5:00pm EST). Purchase/Tech Support: Call AIA National at 1-800-942-7732 or e-mail (Mon - Fri 8:30am-5:00pm EST). AIA Honolulu has a limited stock of paper documents for pick-up. If you can't find the document you need in our form below, make your e-purchase on the AIA National website. Questions? Email AIA Honolulu or call us at (808) 628-7243.